This is a lightly tested pairing of Baduruu and the Ravager Tribe. In creating this deck the goal was just to test the waters to find some synergies for this pairing. I was surprised to find they work fairly well together despite having to include weapons and Ravager things in the same deck. 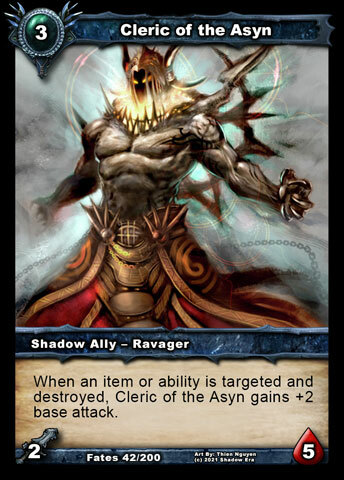 Obviously since the Ravager tribe did not really exist prior the latest Shadow Era expansion most cards belong to Shattered Fates. The goal of this particular deck is to control the board then proceed to beat down the opponent to win. In order to execute the game plan I used a combination of snare traps, high health allies combined and tempo of hero ability to put bows into play to assist with board control. What makes choosing Baduruu over the other Shadow Hunters different aside form cards you use is the tempo boost that the hero ability brings. When you play a bow coupled with a high health ally you are now forcing your opponent to choose between 2 tough decisions. 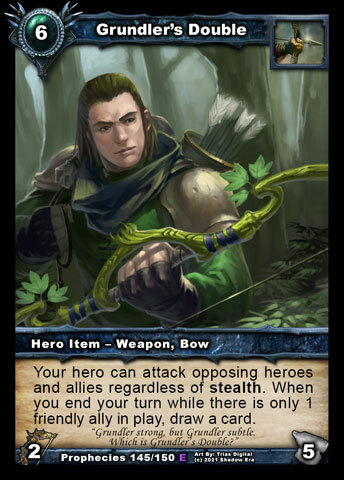 leave the bow and now you have to deal with the wrath of the Ravagers who may begin destroying your items/abilities at will or take out the allies and possibly lose control of board to some strong bows with multiple uses. The stronger allies for this deck are Cleric of the Asyn and Murderous Hulk. Cleric of the Asyn is an excellent pair with Baduruu as opponents will most certainly be holding/saving their Item Destruction cards in this matchup for Baduruu’s bow. If you play a bow with Cleric of the Asyn at the same time and your opponent chooses to destroy your bow you can turn into nice boost for Cleric. Murderous Hulk has high health and increased chance of survivability, and his ability pairs very favorably with Baduruu’s Bows as a one two punch for control. I briefly tried Thriss Demolitionist for his high health but found that I was having trouble playing him or his ability due to lack of resources available. So what I did was swap him out for Spitfire Hound, who proved to be very flexible with Baduruu, triggering his ability damage and having Baduruu finish of the ally with his bow. A nice combo on Turn 4-5 to play Hunter’s Gambit + Spitfire Hound + Bow which can lead to some pretty good board control around this point of the game. Rapacious Vermin is going to be a meta call. In my light testing of the deck I never once used Rapacious Vermin as my opponents were playing light on items/ability or I was destroying what they had keeping me away from the magic number three. I could certain see him being replace without too much trouble. I initially thought that the draw would come specifically from Hunter Gambit and Grundler’s Double but found that I had to include a third source which I chose Crystal Shards for. 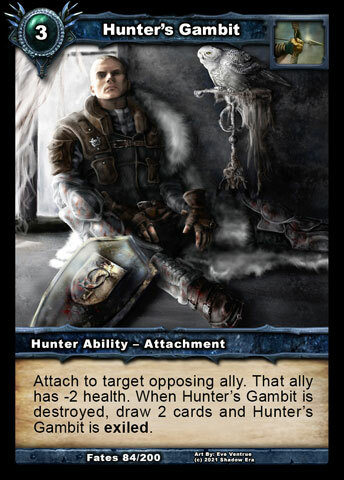 Hunter Gambit is a fantastic draw card that combos very favorably with both Baduruu and the Ravager Tribe (Spitfire Hound / Ravager Zealot. I have found timing to be somewhat inconsistent and often that may be a lack of needing to use Hunters Gambit to actually kill an ally. I was surprised that I did not draw off Grundler’s Double as much as I thought I would. I think the deck has many moving parts and as you are trying to advance the board the draw support is decreased from Grundler’s Double. With that being said I would see bringing in a 3rd weapon as an alternative option. Crystal Shard was the filler draw that is apparently making an appearance in all of my decks. 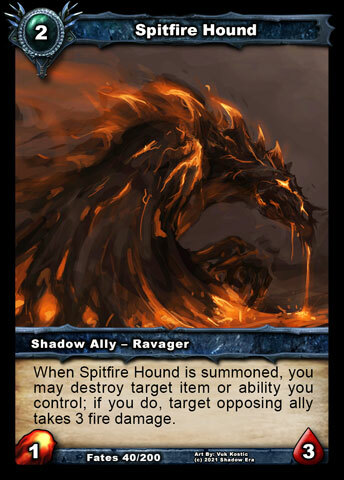 It is just a reasonably cost draw engine that can draw two cards, and be used as a platform to activate Spitfire Hound and Ravager Zealots summon abilities. Since weapons are pretty much a requirement for Baduruu’s ability to work you will ultimately need to game plan for have having some available to use. Typically Baduruu will want to have about 7-8 bows available to guarantee that you are going to get one early for use with hero ability. This many weapons takes up a good amount of deck real estate but the tempo boost and board control more than makes up for this. Grundler’s Double the bow I had envisioned working really well with the pairing of Ravager and Baduruu. To an extent it does work as a decent draw engine during setup turns but then takes a step back as you begin to advance the board. There is great utility in the bow being able to bypass stealth and very high durability. Emore Crossbow is an excellent weapon with many favorable synergies to the Ravagers. Pairs nicely with Murderous Hulk ability, exploding Thriss Almanac, Spitfire Hounds summon ability as all potential candidates to reduce the health of opposing allies and allow the first strike ping of Emore Crossbow to kill before actually attacking and saving the weapons durability. If the Meta is high in Mage I would have no problems changing the distribution of bow to include Soul Seeker. 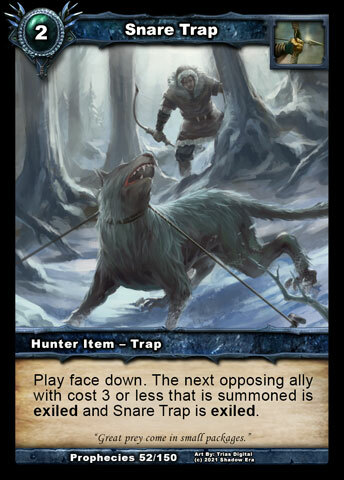 Some of the other cards of the deck are Snare Trap, which I find to be extremely reliable control during the early game and can b used with Spitfire Hound and Ravager Zealot in the right circumstances. More useful than Hunters Gambit in a solo matchup. Thriss Almanac is pretty standard auto include for me. It is what makes the Ravagers a threat. The explosion of Thriss Almanac pairs extremely favorable with Baduruu in a similar ay that Furrion Terror does. Obelisk of Echoes has not had an opportunity to shine as it is not uncommon for Baduruu to be responsible for the death of opposing allies so I would not be surprised if this were swapped out or just used mostly as vault for Spitfire Hound and Ravager Zealot. If I continue to play this deck I would currently replace Rapacious Vermin and probably Obelisk of Echoes with Rampant Krygon. He has overall really good synergy with Baduruu and a few of the Ravagers have high health and could afford to lose an HP in the right circumstances. Tagged baduruu, destruction, Ravager, Shadow era, shattered fates.